Today’s furniture industry requires environmentally responsible practices and many furniture manufacturers are now incorporating energy efficient systems into their factories. With the help of Australian Dust Control, it is possible for factories to reduce their energy consumption and become green friendly. Zuster, a high end contemporary furniture manufacturer, located in Melbourne, commissioned Australian Dust Control to update and replace its existing mobile dust collector units with a new energy efficient and flexible modular reverse flow dust collector system providing a safe and clean working environment for its staff. Australian Dust Control custom designed a reverse flow dust collector which is completely modular, therefore future proofing its business for further expansion at a later date. Another feature which Zuster embraced was Australian Dust Control’s variable speed drive that has the potential to reduce energy bills by up to 50%. The innovative and unique design of Australian Dust Control’s reverse flow dust collector for Zuster consisted of 2 systems. The first one was the reverse flow dust collector fitted with an 18.5kw fan. The second system consisted of a 4.1kw high pressure fan for the outlet feeding back into the duct line which then feeds directly into the reverse flow dust collector. The manufacturing process consisted of 10 sanding tables, all requiring high pressure suction and each with small 25mm diameter suction inlets. The waste consisted of fine sanding dust and wood shavings which feeds directly into a waste bin. 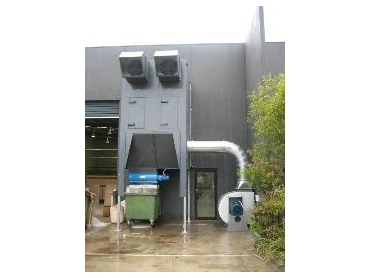 With Zuster’s attention to the finer details of design, they required Australian Dust Control to powder coat the reverse flow dust collector to match the colour of the outside factory building. This is an option which Australian Dust Control already offers to its customers. Australian Dust Control is setting the standard for a new era of energy efficient dust collectors and the reverse flow dust collector is just one of its designs giving many factories the green thumbs up.